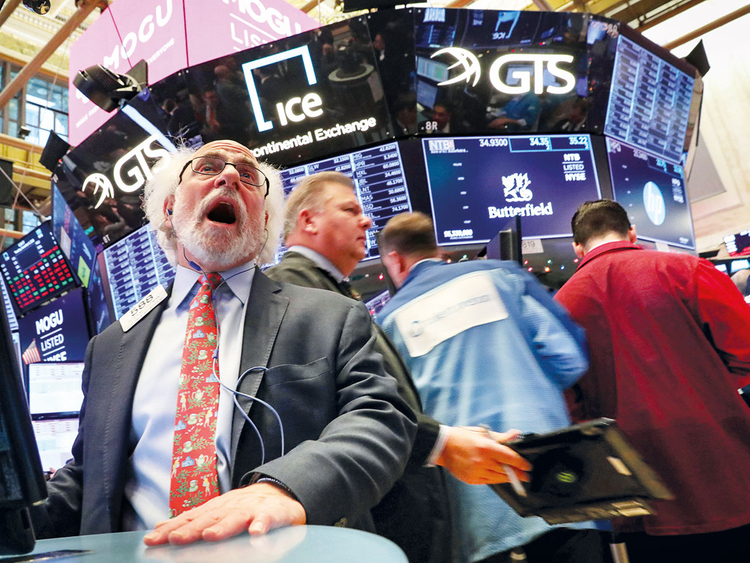 London, New York: US stocks slumped following European and Asian shares lower, as concerns resurfaced that trade tensions between the world’s two largest economies — the US and China — are far from resolved. Oil also slid as Opec ministers met in Vienna. The Dow Jones Industrial Average sank more than 500 points, while S&P 500 resumed its slide after one of the biggest routs of the year. Trade tensions reignited after the arrest of the chief financial officer of tech giant Huawei Technologies Co. — dousing hope China and the US would make immediate progress on a deal. The yuan dropped the most since October. The start of the futures session was marred by a sudden and unexpected plunge that sent a shock wave across equity markets. Whether or not it triggered the slide, Canada’s arrest of the Huawei CFO and reports it may extradite her to the US are a blow to already fragile sentiment, just days after an apparent breakthrough on trade between America and China. Elsewhere, Bank of Japan Governor Haruhiko Kuroda said economic risks from abroad could be severe, and the Federal Reserve’s Beige Book report showed fading optimism over growth prospects at US firms even as most districts continued to report a modest expansion. The pound strengthened as UK Prime Minister Theresa May searched for a compromise to avoid a crushing defeat on her Brexit deal in a key vote in Parliament next week. Indian equities tumbled as investors remained risk averse ahead of the outcome of key state elections that may set the tone ahead of the national ballot in 2019. The S&P BSE Sensex slid 1.6 per cent, the biggest drop since October 11, to 35,312.13, while a gauge of mid-cap stocks — a barometer of retail investor interest — ended at its lowest level in more than a month. UK’s stock investors can wave goodbye to index gains of the last 18 years. The FTSE 100 on Wednesday closed below the level seen at the end of 1999, and extended its declines on Thursday. The benchmark gauge fell as much as 2.9 per cent, the worst drop on a closing basis since June 24, 2016, the day after the Brexit referendum. The renewed sell-off in global equities is piling additional pressure on UK stocks, already rocked by concerns about UKPrime Minister Theresa May’s ability to get her Brexit deal through Parliament.